Was a Christmas gift for my son-in-law who is an avid gourmet cook. He loved the simplicity of the bread recipes but cannot at this point tell you about the flavors of the bread but the instructions are user friendly. This is a great buy! It worked just right for Christmas gifts. One each for my daughters and their husbands, and one for my husband. I matched the flavors to the person and they all said I matched them up perfectly. Haven't baked one up yet but I don't expect a problem. Easy to follow instructions. My husband likes to make bread and he was surprised and delighted to receive this for a Father's Day gift. I bought these for my husband to make with our son who was 5 at the time. He's not much of a cook outside, but they both love bread & were interested in trying some cooking together. These breads were an easy way for them to do that, and they were delicious too! I whole heartedly recommend. So very easy to make and very tasty! This bread is really good and super easy to make. I will definitely buy it again. I love the little bags that the mix comes in and was wondering if any of the more crafty ladies have figured out something cool to do with them? We gave SoberDough as gifts to several family members this past Christmas. Everytime my mother makes a new batch, she lets me know how great the breads are. My family is a big fan. Great product. Thanks! a gift for friends and family! i always try to buy cleaver and fun gifts for people and scored high with this one! great results with this one! i might order one for myself now. You don’t have to be a master baker to make your own delicious bread. 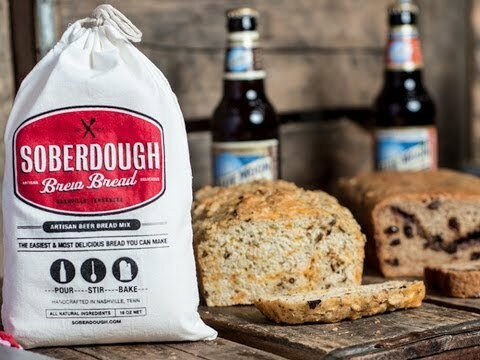 All you need to do is crack open a brew and combine it with your choice of delicious SoberDough bread mixes. Stir, bake, and serve. No cooking skills required and it only takes one hour. 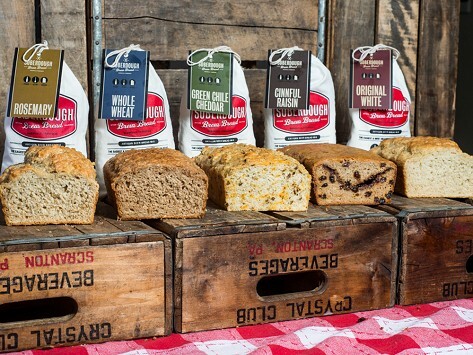 Handcrafted in Nashville, Tennessee by mother and son Jordan Mychal and Veronica Hawbaker, these artisan brew quick bread mixes contain 100% all-natural ingredients, fresh herbs, and seasonings. No preservatives or artificial flavoring. SoberDough comes in a variety of distinctive flavors such as Green Chili Cheddar, Roasted Garlic, and Cinnful Raisin as well as more traditional options like Original White and Honey Wheat.